I was recommended Durham remaps by friends n family. The staff are very polite and friendly. And done a cracking job. Highly recommended. Thank you. Excellent service. Knowledgeable friendly staff who know exactly what you need without any hassle. Well worth visiting. I will be using them all the time from now. Top quality work, nice to meet someone that knows what he's doing. Great service from Ian and Dan, radically changed my RS4 B7 with the new map. Really impressed with the service! Ian was spot on, knew exactly what they were doing, had car diag'd and sorted in no time. Would recommend!!! Very good services everyone very helpful and they do know what they are talking about.if you want remapping doing go to them. As a car buff i've been here with my last 4 cars for various mods and remaps and each time you get a first class service .. and a genuine remap tailored to your car . Been here with my last 3 cars ...highly recommended. ..mini cooper D....audio tt 240 sport and audio tt tdi roadster. ..first class service , advice and quality remapping rolling road tuned to your car . WILL BE BACK AGAIN AS BEST IN NORTHEAST. Spoke to Ian and dan over the phone and were very informative of what the problem could be. Booked it in a week later for the work to be carried out they kept me informed of the diagnosis and carried out the work the same day. These guys know what they are on about and I have now a fantastic performance golf with no issues. 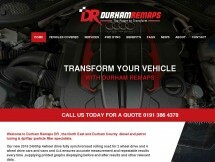 Certainly would recommend Durham Remaps without hesitation. First class experience, would recomend a/1 thinking about getting their cars potential realised to get in touch with durham remaps???? Very professional service with knowledgeable and friendly staff. Completely transformed the performance of my car. I would happily use them again and recommend them. Professional service from start to finish. Dealer level service and a remap for my 330d. I'll only bring my car here from now on. Professional service from start to finish. Full dealer service on my 330d and a remap up to 331bhp. I will only bring my car here from now on. Refer Durham Remaps to your friends. You’ll get (offer), they get (offer) each time. Claim your offer now by simply sharing a link.